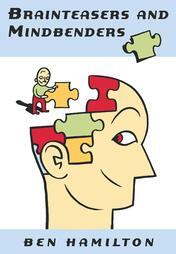 Brainteasers and Mindbenders is a puzzle book by Ben Hamilton, who is one of Britain's top puzzle constructors. The book contains a puzzle or puzzle set for each day of the year (but not for leap years, sorry y'all). I have been able to solve a few of Hamilton's puzzles with little or no effort, but on average this book seems to be tougher than most. Ben clearly loves word puzzles, including anagrams, palindromes, riddles, & many others. He has also provided a number of excellent problems that involve mathematics, logical reasoning, deduction, & lateral thinking. You'll also find teasers that use the names of various literary & historical figures, & geographic names (countries, rivers, etc.). The original version of the book was a "British Edition" published in 1979. The "U.S. Edition" was made in 1981, which is the edition I have, and which you are most likely to find. This is relevant because of the different weights and measures we use, and because the British misspell center, tire, and other simple words. As if it weren't bad enough that they drive on the wrong side of the road ;-) I have also found a puzzle that involved the National Anthem - the U.S. one. I would imagine the 1979 version would not have used this. I think you see my point. 365 puzzles is quite a lot, especially given the difficulty of many of them. Several of the riddles and other problems truly have me stumped, and I make the blasted things for a living! Something that may be a turnoff to some is that the book does not contain any illustrations at all. Not even any silly cartoons like you'll find in many of the Sterling books. All of the puzzles use words, letters and numbers. Of course, this is right up my alley, as that covers about 99.9% of the puzzles I create daily for our Puzzle Contests. I often use this book to get ideas for new puzzles. Despite the lack of graphics (which is no problem for me), this book is very good. I have especially enjoyed the word problems that are mathematical or logical in nature. I would rank this in my top 10 teaser/puzzle books. You can find Brainteasers and Mindbenders online for purchase here.